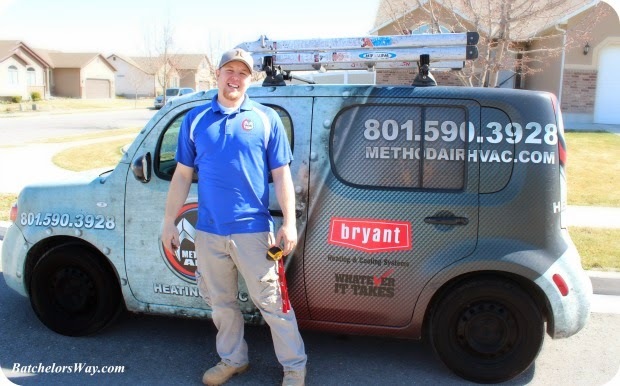 I had an opportunity to have Method Air come to my house and do a furnace tune up and 23 point inspection. We have neglected our furnace. I do pretty good, I thought, at changing the filters but that was about it. I just have to share what I learned with ya, cause just maybe you have neglected your furnace too!! Jake is the repair man that showed up at my house. He was great! I mean as soon as he walked in I said, "I'm going to watch everything you do, ask questions and probably take photo's, OK?" He was totally fine with that. So down to the basement we went. He explained everything he was doing as he went along. OK on to what he did and what I learned. change your filter every month!!! Cheaper filters are fine in his book, just make sure you change them. If you have allergy problems you may want a better filter. First he cleaned and vacuumed everything. 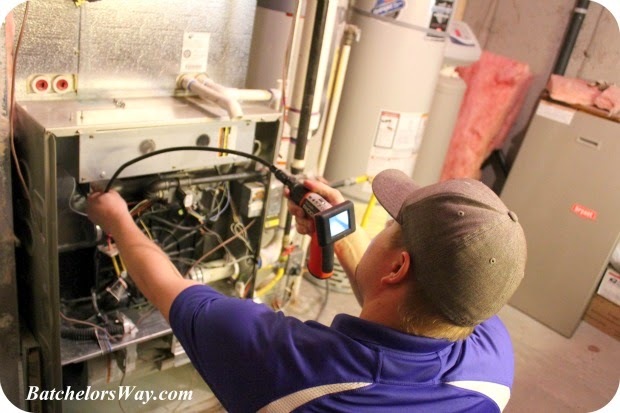 You can vacuum out the main part of you furnace, if you so desire, just make sure you turn it off before you do. Just don't try to vacuum the coils yourself because they are easily damaged. Save that for Jake!! I think I need his video camera tool!! OK seriously, I do want the stick flashlight in the next picture. It was nice and bright, but what was so great is it's magnetic. You just stick it to something metal and both hands are free to work!! All right back to my furnace. Once he took off the front of my furnace there were these peep holes you could look through and see the flames. Why do you need to look at the flames? Well a steady blue flame is what you should see. Yellow or choppy flames both mean you need service. There is also another peep hole window that you can see a blinking light in. Did you know on many units there is a list of codes? You look at the blinking light and record the series of long and short blinks and then look on the code list to help determined what is wrong. When you call your service guy he can then know what is most likely wrong and bring the needed parts. Or better yet he may be able to help you over the phone. Some codes can be corrected by changing the filter!! Seriously people, why did I not know any of this before? Jake was very honest and fun to talk with. He answered all my questions and more. He said he actually likes clients that like to talk and know what's going on with their unit. My most embarrassing favorite part was towards the end when Jake was testing my unit. Once he turned it back on it made its usual racket. He quickly turned it off and asked if I wanted him to fix that noise. Yeah, we had a filter that had been sucked into our machine. Probably forgot to change that baby so air couldn't get by it!! Would I use Method Air? Why? They seemed very trustworthy and their customer service it top notch. Everyone I worked with on the phone or in person was great. Customer service is very important to them. Too many companies don't really care, but these guys do. But don't take my word for it, they have an app you can get and then post pictures or comments about your experience or you can do that on their Facebook page also. Go see what others think. You can also go to their web site to learn more about their services, prices or any other questions you have. I exchanged services for my opion, but all opinions are my own.